A lot of people seem to have trouble visualizing the layout of the mountain, the lake, the town on the lake platform/against the mountain, and the Vatnfjall ruins. Last edited by Rias on Thu Aug 13, 2015 4:16 pm, edited 1 time in total. I've actually always been really interested to see how other players visualize areas of CLOK. Some of my favorite areas to mentally vizualize are Shadgard/Redrock, Stone Canyon/Red Lake, Steinnvatn Vil, Dwaedn Vil/Naerhiminn Fell, Brackenridge Pass, and Kildr Dale/Caves. A deeply gouged pass into the southern mountains leading into a box canyon. this pass is no more than a few horse lengths wide yet the mountains gradually rise up to overwhelming heights on the east and west leaving only a narrow, relatively speaking, gap for you to traverse. Once the pioneers of Shadgard had a gate that sheltered them at a particular bend in the pass but it has fallen into ruin after years of battle. taking an abrupt turn in direction at this point, the gap expands out into a respectable size area gradually opening up further to the south. Better thought and effort were obviously taken in the construction of this new gatehouse and it is well maintained unlike the temporary and now fallen stopgap gate you recently passed. Shadgardians, being the industrious and pioneering folk that they are, have made excellent use of the available space that opens up behind the gatehouse. With shops and homes built close together yet still not quite crowded the one thing you'll not really have to worry about in this small town is having to walk too far for something you are looking for. constantly overshadowed by the high mountains in all directions save north, various establishments have been built up against the walls saving both on building materials and space, some have even gone so far as to use natural caves as the basis for their buildings and just carved out spectacular yet modest buildings out of the rockface itself. Knowing the value of a good bolthole, most shop owners and some residents have even taken it upon themselves to carve out life saving basements or cellars into the rocky ground where food stuffs can be stored or defenceless citizens can flee to shelter in case of emergency. Of particular interest in Shadgard are the mine shaft and the moaning winds that pass through the higher reaches of the mountains. while quite well worked, the mine stretching into the eastern rockface must have started out as just another open fissure. Now it has been built up and widened to allow even the largest of wagon teams. Perhaps the path on the western rockface was there all along, perhaps not. One can climb the path to look out over the town of shadgard and test their metal against the fearsome winds that blow through a natural cave that was worn out through centuries of weathering and rain. While all and all Shadgard is a small, enclosed town where the jostling of elbows is frequent and there doesn't seem to be room to escape from the everyday trials of life, there are still the necessities of life as well as a few establishments built solely for letting the residents relax and enjoy some time away from the rigorous life of a pioneer. I have often considered doing some CLOK woodburnings... and, of course, selling them to other players at an exhorbitant price. But now that I see your mad skills, Rias, I don't think I could compete if you opened shop. You are an AR-TEEST! I think my favorite part of the picture is the label "Spooky Fog"
I'm bumping this - I uploaded the image as an attachment so it's no longer broken. And also, letting people know that I'm fixing up some post-release rooms and rumors in Mistral Lake that seem to indicate that the town is built on the shore near the lake. It's not - it's built on a wooden platform over the lake, mostly. The platform is built against the mountainside to the north, and a path leads from there up and along the mountainside for the northernmost end of town. I added a bunch of (rarely-firing) idle scripts to all the outdoor lake platform areas to reinforce the idea and remind people that they are indeed on a platform over the lake, not next to the lake. A few people have had occasion to return at various times. I actually had never once visualized the mountain at ANY point, though the rest I can pretty easily see. I <3 artistic reprensentations of mud stuff though, whether it be characters or places or anything else. my question is how does said lake platform not need fixing up? or does it? I mean, water that close to a lake...warping/rotting. merin wrote: my question is how does said lake platform not need fixing up? or does it? I mean, water that close to a lake...warping/rotting. Who says it doesn't? I'm sure there are plenty of steady jobs dealing with the the town's maintenance due to its unique setup. You can thank those NPCs for keeping the town from falling into the lake! I always imagined that Mistral Lake looked something similar to Laketown (AKA Esgaroth) from The Hobbit! They both have the wooden village on top of water thing going on. 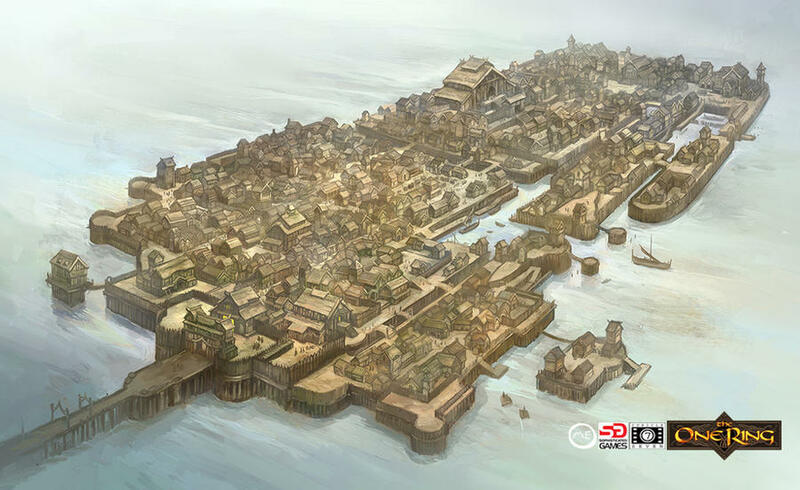 Except one side would be backed up against a giant mountain, and the city itself would be more more winding (like Venice) as opposed to being one single floating deck. And I suppose that long ramp to the lower left would lead to the ruins instead of solid land.